Most home and business owners know what masonry is. It’s pretty apparent when you see a brick building. Aside from brick, however, not many people know much about masonry – including how their fireplaces and chimneys are built. It’s understandable. Masonry is a specialized field. It takes training and experience to know how to build with bricks or stone and mortar. It’s also a building method that has been used for many hundreds of years. The work of a good mason can withstand any kind of weather. Whether your home has walls of solid masonry, a brick chimney, or stone veneer, it’s worth having a little basic knowledge. 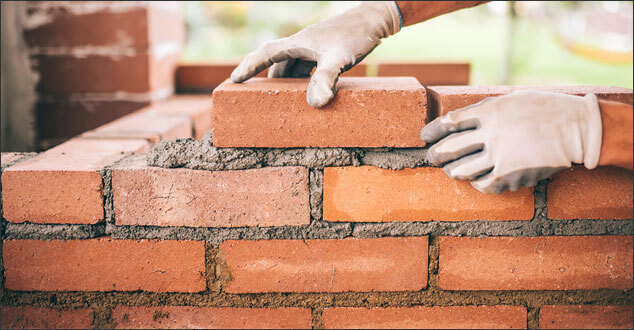 Masonry means anything that is constructed by fusing together individual pieces of brick, stone, concrete blocks, marble or other materials with mortar. Mortar is a binding material and can be made out of a variety of substances mixed with sand. Lime, cement, and soil are a few of the materials commonly used for masonry mortar. Mortar is different from spackling in that it uses sand. There are two primary uses for masonry in construction – solid masonry and veneer masonry. Solid masonry refers to masonry constructed to stand on its own, bear weight and withstand the elements. Whole houses can be made of masonry. Load bearing walls are often made of masonry. Concrete block foundations are masonry. And chimney construction is usually made of masonry as well. When structures are made out of masonry, the components used – the brick or stone and the type of mortar – must be rated to withstand both the load and the weather where it’s built. For this reason, mortar is rated for its strength and ability to withstand these things. Mortar is rated M, S, N, and O with type “M” being the strongest and “O” being the least strong. Veneer masonry is constructed on the outside of an existing structure to change its appearance. It’s not made to stand on its own. An indoor fireplace, for instance, may have solid and veneer masonry elements. The nicer bricks may be used to finish the look of a hearth and chimney that is actually constructed of a different material. Masonry veneer doesn’t need to be built to carry a load. The only concern for interior masonry is its final look, as it doesn’t need to withstand extremes of weather. Any individual pieces mortared together to form a structure can be called masonry. The most popular forms, however, are brick, stone, and concrete block. Brick masonry is classic, fashionable, and very good at keeping your home insulated. Bricks can be laid in a serpentine pattern – meaning each row is staggered. The serpentine style is known to be very strong. Concrete block masonry is often used as the foundation of older homes. Concrete blocks are strong, they can be laid in a serpentine pattern, and they can be laid quickly because they are so much bigger than bricks. Additionally, concrete blocks are used to form the walls of many types of commercial building because of these qualities. Stone masonry can be done with dressed or undressed stone. Dressed stone is actually shaped to make it more uniform and easier to lay. You see dressed stone used in a lot of stone veneer on the fronts of houses and hearths because it lends a clean, modern look. Undressed stone, also called fieldstone, can take a lot of skill to lay correctly. Undressed stone will not be uniform, and laying it in the form of a wall or a fireplace is often called “rubble masonry.” This is more suitable for a rustic look and is often found on some of the oldest masonry dwellings and fences all over the world. Masonry work is a fascinating and skilled trade. No matter how much, or how little masonry your home or business contains, it’s vital to the look, feel and safety of your home or business. Although masonry is built to last, you have to take care of it just like any other component of your home or business. Do you live or own a business in Southeast Michigan? If you have any questions regarding your chimney or other masonry work, please give us a call at Renovations Roofing & Remodeling, Inc.!